The Cohen Chiropractic Trigger Point Center offers a wide range of services to treat all types of musculoskeletal problems. The modalities used range from specific muscle work and trigger point therapy, to manual manipulation, to nutritional counseling and physical rehabilitation. When needed, adjunct modalities such as traction and cold laser therapy can be used to aid in a faster recovery. This method, also known as Receptor-Tonus Technique, is a specific muscle therapy commonly referred to as trigger (or pressure) point therapy, or acupuncture. It is referred to as a type of acupressure since it is performed by applying manual pressure to tender knots in the muscle called trigger points. This technique is effective for musculoskeletal problems from the feet to the jaw and all areas in between. Precise pressure on the trigger points in a tight muscle blocks the nerve impulses that keep the muscle in spasm, letting the muscle relax. This relieves pain and restores normal biomechanical function to the affected area. The technique provides relief from conditions ranging from strains and sprains, herniated or bulging discs, to repetitive motion disorders such as carpel tunnel syndrome and TMJ disorder. A proprietary protocol, NimmoCareSM Laser, developed by Dr. Cohen available only to licensed NimmoCareSM practitioners. This treatment combines the healing capabilities of the trigger point work with cold laser therapy. Cold laser therapy helps stimulate the muscle cells to heal on a molecular level. The cold laser helps decrease cell membrane permeability, stimulates cellular growth, and decreases inflammation to help the muscles heal from the inside out. One theory on how the cold laser works, is that it creates micro-traumas in the muscle fibers which causes the body to mount an acute inflammatory response to. This is one of the theories on how acupuncture works. This laser treatment, in combination with our trigger point technique, helps decrease muscle spasm and irritation. Also called Flexion Distraction, this technique utilizes a special section of the chiropractic table equipped with a movable leg piece. This table moves up and down and side to side, specifically stretching out the muscles of the lower back. The movement of the table provides traction to the muscles and gaps the joint and discs in the lower back. This technique is useful in reducing bulging/herniated discs and strained lower back and hip, muscles and ligaments. Chiropractors utilize this method to treat musculoskeletal pain. The manipulation consists of a high velocity, low amplitude thrust to a joint that is restricted from moving properly, thereby restoring normal motion to the joint. 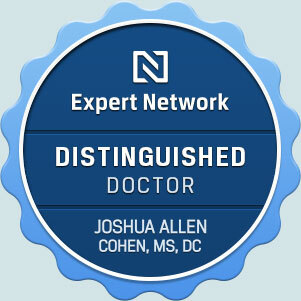 Dr. Joshua Cohen provides nutritional counseling and exercise advice. He will analyze a patient’s diet and lifestyle and recommend a program to help the patient achieve a goal of pain reduction, increased activity levels, reduced inflammation, and increased lifespan through healthy eating. These consultations can assist a patient in sorting through the immense amount of dietary information, and misinformation, available. This will help the patient make more informed decisions as to which diet works, and which program is the best for their specific needs. The most up to date research has shown that nutrition is a more effective and natural way to deal with certain mild to moderate disease processes than traditional medicine. Examples of these diseases include diabetes, high blood pressure, and thyroid disorders to name a few. When appropriate, the doctors will devise exercise routines to help keep a patient healthy and free of pain. These routines can strengthen weakened areas that cause musculoskeletal problems and stretch tense muscles to promote postural balance. 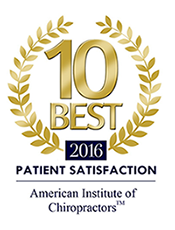 We believe that it is our job to get patients out of pain and to instruct them to be proactive to keep themselves pain free in settings outside of our office. We can scan our patients feet for custom made orthotic inserts at our office. These functional orthotics support the three arches of the feet, and have been proven to help reduce pain and balance the body from the ground up. Functional orthotics can help with active pain, provide preventative care, and help athletic performance. As doctors, we realize that we cannot treat every complaint presented. When needed, we refer the patient to other health professionals for consults and appropriate treatment. We have a large referral base that includes orthopedists, oncologists, rheumatologists, primary care physicians, physical therapists, acupuncturists and a host of other health care professionals. We work closely with all aspects of the medical community and share our knowledge with the medical profession.